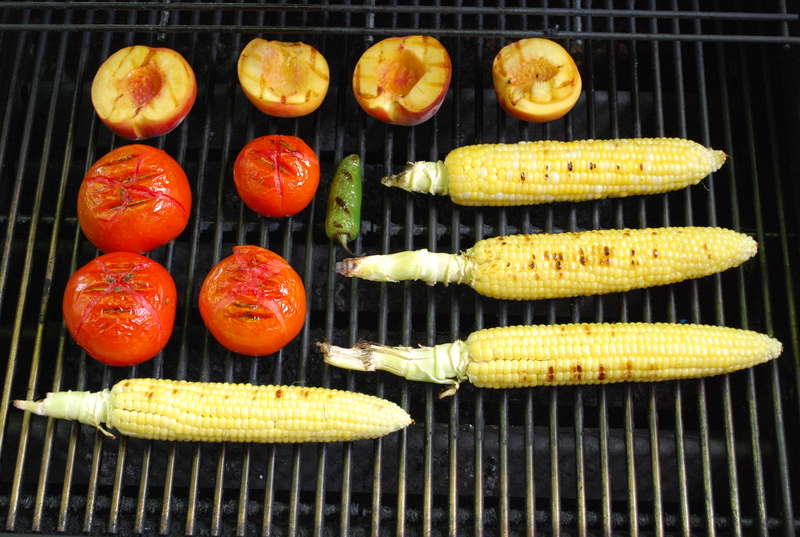 Nothing says “September” like corn, peaches, and tomatoes, fresh from the farmers’ market. I had an abundance of all of them so decided to make corn soup and corn salsa. Here’s the salsa recipe. Just grill up these babies, mix with a few other critical ingredients, and, presto, you’ve got a dip to accompany blue corn chips, a nice tangy sauce for BBQ veggies or chicken (for the meat eaters in the house), or a nice light lunch if thrown on top of, or beside, fresh greens. Heat up the grill on medium-high. While the grill is heating, prep the vegetables. Core the tomatoes and cut a small x on the bottom. Lightly oil them and place them on the grill. Shuck the corn, lightly oil it, and place it on the grill. Place the whole chiles on the grill. Peel, halve, and pit the peaches and set aside. Grill the vegetables for about 15 minutes, turning frequently. If you’re using an outdoor grill, mind the tomatoes. If they get too soft, they’ll melt right through the grates. Once all the vegetables have some colouring and are cooked, about 15 minutes, remove and let cool. While the vegetables are cooling, grill the peaches for about 1 minute, then turn and grill for 1 minute more. Remove and let cool. Once cool, chop tomatoes and put into a large bowl. 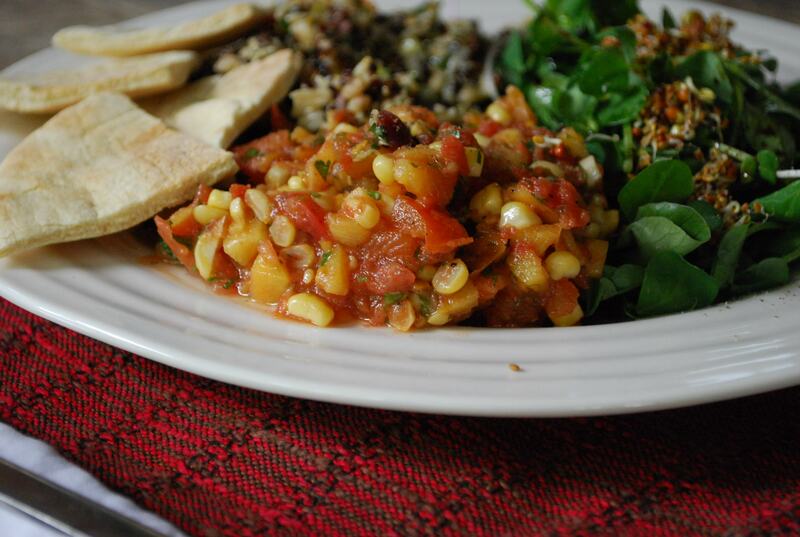 Remove the corn from the cob and place in the bowl with the tomatoes. De-seed the chiles, mince, and add to the bowl. Dice the peaches and add to the bowl. Add the olive oil, vinegar, lime juice, salt, and cumin. Mix well, taste, and adjust seasoning. It will get spicier as it sits. Let it sit in the refrigerator for at least 30 minutes. Remove from the fridge, add fresh, chopped cilantro or parsley and enjoy!